Nicco Mele began his foray into the new media world as the webmaster for Governor Howard Dean’s 2004 presidential bid where his use of technology and social media revolutionized political fundraising and pushed American politics into the digital age. An internet strategist and leading thinker in the space, was later to become a fellow at the Neiman Foundation at Harvard, an adjunct lecturer at the Kennedy School and now at 37, he has been made Deputy Publisher of the LA Times. LA Times Publisher Austin Beutner said in the announcement, “With Nicco, we truly have a digital native to help us reimagine our business and develop new digital revenue streams." I sat down with Mele in his Kennedy School office in Harvard Square where he was handing out free books from his bookshelves to students and peers while packing up to head west. 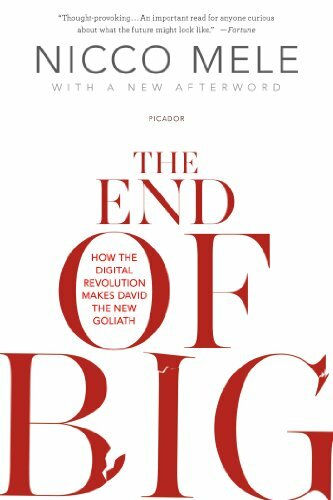 His book The End of Big: How The Internet Makes David The New Goliath explores the consequences of living in a socially-connected society. How does it feel to be the new Deputy Publisher of the Los Angeles Times? Equally parts exciting and terrifying. For 100 to 150 years, newspapers have been this crucial part of our community's work and also part of how our democracy works. They have done everything from facilitated neighborhood meetings to held power accountable, but over the last twenty years the business that has funded that community work has disappeared or moved. Figuring out how to bring to the core values of journalism, newspapers, and communities in the country and in the politics together and figuring out those core values of information or curated information or shared public attention is my focus. How can we build businesses that help fund that and holding power accountable in a real and independent way? What's on your to do list in your last four weeks in Cambridge? What do I not have left to do? I have like ninety-four papers to grade, I have dozens of clients and business partners and startups I'm involved with to help, and I have to have a baby, and change some diapers. Pack up the house. There's no shortage of things. What's on your desk when you arrive at the LA Times? Improving digital subscription, even a membership program for people to be members of the organization in a digital way that's compelling and exciting. Looking at the different digital properties that currently exist and how advertising and sponsorship works on them, but also beginning to really understand the core assets in the business and how we can build more diverse revenue streams. I think we're going to look back on the last 100-some odd years and see advertising as this bizarre anomaly as a way of funding content, and yet almost all news has been funded almost entirely by advertising. Figuring out other ways of funding news is top of the list. Where might capital come from? I've written a fair bit over the last five years about quite literally a dozen or more experiments I'd like to try, but talk is cheap. Actually making them work inside an established 133-year institution is a different beast. I'm very curious to see what happens when I take some of my ideas about what might work and consider the core assets of the institution. What opportunities are there? What are some of the challenges? How do my ideas from the ivory tower match up with the realities on the ground. What are a few examples of things you've written about? Probably the most popular one is a piece I wrote for Nieman Lab when the Boston Globe, the LA Times, the Chicago Tribune, and the Washington Post were all for sale. I started imagining, 'if I bought one of these, what would I do?' and one of my core beliefs about our technology is that it profoundly empowers individuals. If you go look at the top thousand accounts on Twitter, they're all individuals. Compare the number of people following the New York Times with the top five journalists’ followings on Twitter or the top five journalists employed by the New York Times. Even the investigative reporters have an individual presence. The internet/social media is a profoundly individual medium. It's about individuals and their own kind of personal brands and their own personal styles. This is not an accident. It's the nature of 'your phone is yours' and that technological reality is reorganizing the institutions of journalism. In the history of journalism, especially in newspapers, there's been an instinct to downplay the byline, to play up the institutional and play down the individual. And that is simply incompatible with the realities of technological distribution. We have to ask, how do we encourage that in a way that's consistent with the core values of journalism? How do we encourage that in a way that doesn't disrupt any of the important parts of the job that are about integrity and accountability but also help the place thrive and help it look and feel different? Are we in a person-to-person media? I don't know that we're in a person-to -person media cycle. I'm a little reluctant to go there right away because someone who has 18 million followers; that's not really person-to-person. It's more about a media that is unfriendly to institutions. If you look at someone like Christiane Amanpour who has long been a voice on the Middle East, what do you see? I would say that TV and radio have always been much more about the individual. You can probably name more NPR reporters than you can any print publications. Maybe it's about adopting more of the radio and TV mindset in terms of how we think about and compensate talent. In one of the pieces I wrote, I talk about how Nate Silver is driving 20% of the New York Times traffic the day before the election and he has a book out and he has to choose: Is he going to promote his book or is he going to promote the New York Times? It is crazy to me that we would take top talent and force them every day to choose where their priorities lie. Everybody's incentive should be aligned. In the current newsrooms, most of the time they're not. It never felt like that. I have just always been curious. I loved technology and I loved politics and power, which is how I got to media. I kind of accidentally ended up in the right place at the right time. In your book The End of Big, you talk about unintended consequences of new technology. One of them is fringe political force. How you talk about this in reference to ISIS? My central thesis is that technology empowers the individual. The power that used to be very institutional is now more diffuse. When power is more diffuse, it doesn't completely level the playing field, but a significant leveling occurs. Over a decade of going after Osama Bin Laden and Al Qaeda, depending on how you count it, you could say we spent somewhere in the neighborhood of $3 trillion, maybe even $4 trillion. And the most aggressive estimate I could find by everybody who studies this is that Al Qaeda in the same time period spent something like $5 million. In some ways, size and complexity becomes an impediment to success. It's not that when you're big you can't be successful, but it used to be that being big was always an asset. When you were big, you could dictate all kinds of things. Scale was inherently more valuable and I don't believe that's true anymore. I think technology has pushed the power to the individual and this diffusion has really commoditized scale. Anybody with the right tools and a little bit of money can copy. Yet in the US, the two-party system still seems strong. Will new technology give rise to new ideological ideas in stable economies like ours? Barack Obama would not be president if it were not for the Internet. Hillary Clinton would be president. There's no doubt. If you go back and look at the media and the polling, Hillary was supposed to be president. Hillary spent her whole life running for president. She's worked on every presidential campaign since she was eighteen. Her husband is the most popular democratic president probably since FDR. She knows everybody. She knows the activists, the donors and she's generally pretty well liked. Yet she loses to a man who's been in public life less than a decade. How is that even possible? And look at what the Tea Party is doing to the Republican Party. The two major parties are radically different than what they were a decade ago and I argue that is thanks to the way the Internet has shaped them. And to the way these two parties have failed in their own way. They have created an opening for insurgents and activists, empowered by technology, to disrupt them. Those two parties still seem invincible and in tact. They are the only two real parties in politics in a country that seems at a stalemate. I would submit to you that the Republican Party looks almost nothing like it did fifteen years ago. To even call it the same party is mildly ludicrous. It has the same name but it is nothing… George Bush Senior could never be the nominee of the Republican Party today. Never. I have some suspicion Ronald Reagan might not be able to be the nominee in the Republican Party today. It’s a profoundly different political landscape and not necessarily a better one. How will social media affect the 2016 election? Technology really empowers, serves and is bad for establishment figures: if you are a perceived frontrunner such as Hillary Clinton and Jeb Bush, you can't win. You will be taken down by social media. How will new technology and micro businesses improve things as they diffuse the power halls? I think that this diffusion of power, this pushing of technology to individuals, is very threatening to established power, but it is also probably our only hope out of the cul-de-sac of climate change. At the most basic, moving from a power plant in the hub and spoke model of power production and distribution to a distributed grid where everybody has solar power panels or wind turbines or whatever and people are sharing energy in a network way is how we will move to a post oil economy. For everything, from food production and distribution, to transportation, to schools, all of that is really going to depend on small pieces loosely joined, to use David Weinberger's phrase. My mission is very simple: hold power accountable. Hold power accountable. The entire history of the human race is about what happens when power is concentrated. Power corrupts and the public good is not served. My interest and my motivating passion in politics, media and teaching, and anything is about how we hold power accountable to create better outcomes for the public good. Right now, certainly in the United States, both parties are a long way from any real accountability. We’re facing crisis after crisis, whether it is immigration and these five year olds in detention in cells on the border, or it's climate change, or it's nuclear proliferation, or it's the end of the American Dream and the giant chasm between the rich and the poor in America…across the board, our leaders are not accountable to that and they are taking us down into a terrible place. They're doing that because there's a lot of money and power invested in the way things are and so to the extent to which we can build systems and institutions that promote accountability, that demand justice, is difficult. My greatest fear about all the disruption talk is that all it does is perpetuate the status quo in terms of wealth and power. Let's look at how many tech startups have over a billion dollar evaluations in the last ten years. How many were started by somebody who's not a white male from an Ivy League institution? How many? I don't know either but I will bet you it's somewhere between zero and one because the great challenge of our time is this myth that technology is going to make everything better. When you were lecturing at the Nieman Foundation, what was your biggest insight into the future of journalism? I don't know where we're going to be. I'm thirty-seven and most of my experience in journalism is that they missed the boat. Most of the major media institutions in the country were cheering on the Iraq War. Nobody credibly assessed the 'weapons of mass destruction' claim. Actually, the Washington Post did but buried it, or purposely did not make it a lead, which is almost worse. We have the subprime mortgage fiasco and crisis where still no one has been held accountable. My experience at Harvard in the Kennedy School and at the Nieman Foundation has been coming to understand all the ways journalism is successful at holding power accountable. It’s very much been a conversion experience for me because when I got into politics and technology, it did not feel like the media was on our side in terms of holding power accountable. I think that I have learned and been convinced otherwise. It has its failings but it is far and away the most significant institution in the United States for holding power accountable and outside the United States, even more so. How will media change society in terms of knowledge? If you're a young, curious person, this is the best time ever to be alive. The ability to reach out and download syllabi and readings from major universities from anywhere in the world is awesome. Why did you start Mass Poetry Festival? That's easy. Poetry sustains me. I memorize poems as a hobby. You can call it a form of prayer. I walk around with 400 poets in my head commenting on my day. What public opinion would you most like to change? The sense of profound apathy and disengagement from what's possible in a democracy. Your wife, Morra Aarons, also a digital native, blogs often about women in the work place on her site womenandwork.org. What do you think about what she's doing and how it might move the needle? It's more important than my work. Because the patriarchy has been in charge for a long time and I'm not sure we're better off for it. The LA Times. Online. QZ.com. Techpresident.com. Next Draft. New York Review of Books. American Press Institute. Almost all of them in the form of emails. Do you read anything in print? I read The New York Review of Books in print. I love it and I read poetry in print. I read almost everything else digitally but poetry I have not been able to read any other way. Will you start a poetry group in LA? What event are you looking forward to this year? The LA Times Festival of Books. It's supposed to be the best book festival in the United States and I knew that before I had any involvement with the LA Times. Anything else you're looking forward to in LA? I can't wait to go to the La Brea Tar Pits. Also, The Huntington Library. My great grandfather lived in Pasadena and I want to track down some of my family history.